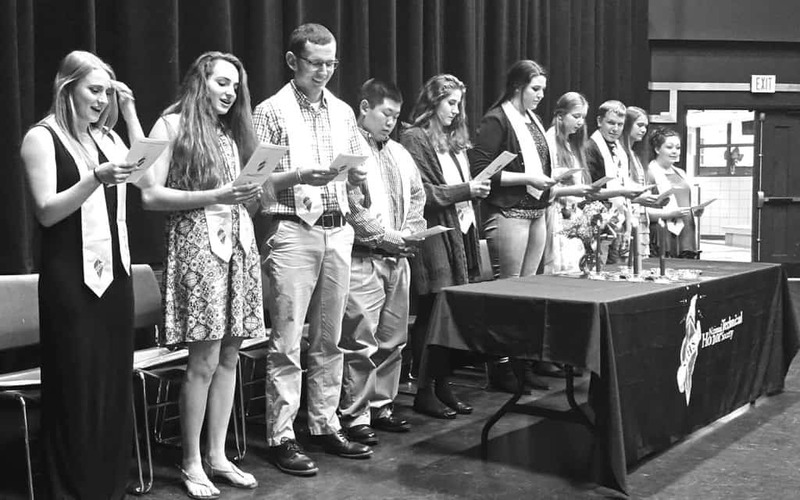 On Thursday, May 11, friends and families gathered at the Rutland High School Theater to honor the 2017 inductees to the National Technical Honor Society. Every year Stafford Technical Center inducts students to the society who have met the criteria of an 88 or better in the student’s academic classes and a 90 or better in their program area as well as having stellar attendance. Six sending schools were represented as well as one homeschooled student. National Technical Honor Society inductees read the NTHS Pledge at the closing of the induction ceremony. Pictured left to right are Madeline Morse, Courtney Lee, Andrew Cassidy, Eric Morton, Lily Crowley, Courtney Bane, Brooke Otto, Austin May, Lillianne Seward and Janine Smith.